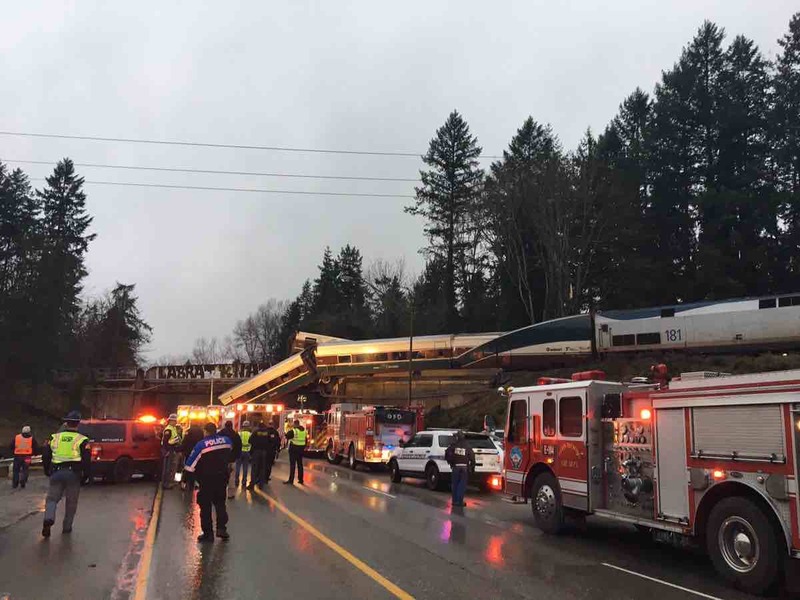 Washington, Dec 19: An Amtrak passenger train derailed on Monday on its inaugural trip on a new service route near Dupont, Washington, spilling 13 cars off an overpass and killing several people. According to Ed Troyer, spokesman for the Pierce County Sheriff's Office and the Washington State Patrol, the deaths "are all contained to the train and the incident is "pretty horrific." Troyer said there were "multiple fatalities" but he could not provide a precise number, CNN reported. Several motorists were struck by the fallen train cars and also suffered injuries, but there were no fatalities among people in those vehicles, the sheriff's office said. Thirteen cars jumped the track. The train had 14 cars, including two engines, said Brook Bova of the Washington State Patrol. At least 77 people were taken to hospitals, including victims who were able to walk off the train, the authorities were quoted as saying. An Amtrak spokesperson said there were about 78 passengers and five crew members on board the train when the accident happened. Washington state Governor Jay Inslee declared a state of emergency in the aftermath of the accident.